It is late Thursday evening, and students have gathered with multiple laptops and projectors, lighting the dull walls of DeMoss fourth floor classrooms with the vibrant, projected colors of video game screens. The fencing club is artfully whacking each other next door, but they cannot be heard over the excited chatter of the Gaming Club, one of the largest clubs on campus. There are a number of new elements to Liberty University’s Gaming Club this year, but one of the most remarkable is the presence of its esports division. Esports are different from the other club activities. In esports, students can organize themselves into team rosters and play against the teams of other colleges. Games include “Overwatch,” “Rainbow 6 Siege,” “Call of Duty” and many more. 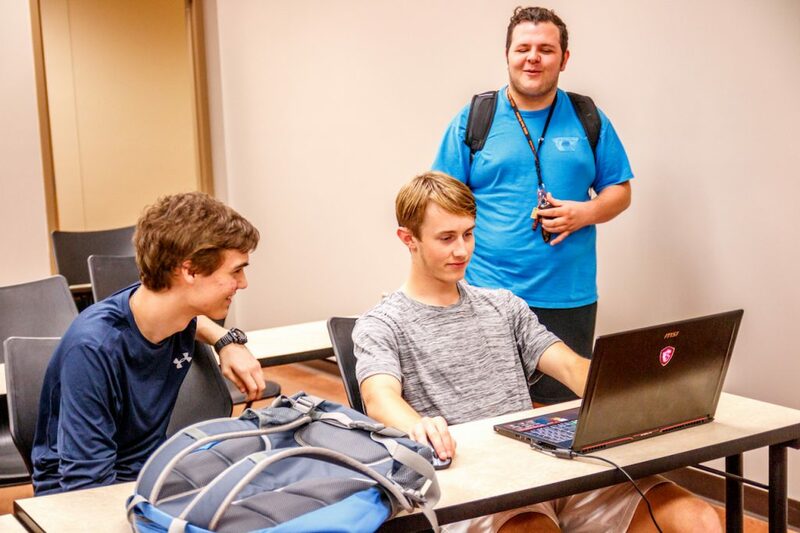 Jacen Garriss, the president of the Gaming Club, is especially passionate about esports He was there when the teams first got their start last year. “We started mid-fall of 2017 with five guys, and over the course of the fall and then the spring we went over 70 or 80 students competing,” Garriss said. Garriss said he does not yet have the official numbers of players for this semester, but it is over 100. According to Garriss, Liberty’s Student Government Association said clubs are not supposed to be tournament sports teams. However, the intention of the esports teams is not to stay with the Gaming Club but to join the roster of club sports. The process of becoming an official club sport was complicated, so for the time being esports has joined the ranks of the Gaming Club. Meell thinks many other colleges are tending toward recognizing esports as a sport. Garriss thinks the esports club would gain a greater measure of professionalism as a club sport, as the university lays out rules and requires practices. The greater university funding would be helpful as well. Garriss said the and other leaders of the club had spoken to various faculty and that the road to possibly becoming a club sport would be slow. He says that, beyond gaining approval, it would take time to put together equipment and a budget, organize practice and find faculty to oversee the sport. “Nobody in the (present) program will see Liberty esports at its best, because it takes time,” Garriss said. The Gaming club meets every Thursday evening from 6:30-9:30 p.m. in Demoss room 4326.